BIRDMAN is a laugh-out loud satire on the insecurity of the actors and bitter negativity of critics that also plays as a tragic tale of mental illness. It's also a technical tour-de-force of cinematography that's meant to take you right inside the claustrophobic mania of its lead character - a device that both impressed and alienated me and made the experience of this film less visceral than it should be. It's a great film and a failed film all at once - ambitious both in its subject matter and style - way beyond anything Hollywood is currently giving us. Noble in its pitch and flawed in its final act. Michael Keaton riffs on his own past to play Riggan Thomson, a Hollywood star who used to play a superhero called Birdman. Today, he's old, divorced, with a daughter just out of rehab and a legacy he's unsure of. Still beloved by the public, Riggan wants more - he wants artistic credibility. He wants to literally be the star who makes the front page when he goes down in a plane crash with George Clooney. The fine line the movie walks is whether Riggan is just another insecure Hollywood star or whether he's genuinely unwell - is he really seeing Birdman and the musicians who form the backing track to this film? Does he really think he has superpowers? The evidence in favour of the first theory is that everyone else in the theatre is as insecure as he is, from the ageing starlet played by Naomi Watts to the self-parodying method actor played by Ed Norton. In fact, it's arguably Ed Norton who cuts closest to the bone in his portrayal of the gifted actor who can't be real in real life, and self-sabotages every project he's in. You have to wonder at the psychology behind Norton - the real Norton - who is so willing to portray himself as a vulnerable douchebag on film. Writer-director Alejandro Gonzales Inarritu (21 GRAMS, Y TU MAMA TAMBIEN) weaves all this insecurity into a deliciously dangerously funny confection with the acting more than holding its own against the conceit of the cinematography. Director of Photography Emmanuel Lubezki (GRAVITY, THE TREE OF LIFE) manages to make the two hour movie look like it was shot in a single fluid two-hour take, even though we know it was filmed in ten-minute (still very long) takes and digitally stitched together. What this does it take us on a claustrophobic dance through and around the interior of the real life St James theatre on Broadway - itself a metaphor for Riggan's career - faded, decrepit, full of past splendors, hosting maybe one last chance at greatness. It took me a while to get used to - or maybe I should say passed - this conceit. It was almost distracting, but I guess it's kind of the point of the film. In its final act, the movie does something even more daring, which to reveal would spoil the film. This is the kind of thing the internet lives for, and I'm sure the message boards are spinning with theories. Suffice to say that to my mind the final shot of this film - the exhilarated glee in the eye of perhaps the most fascinating character - is the saddest thing in cinema this year - suggesting the inheritance of fragility and delusion. I found it all too clever clever and distracting in the same way that I don't typically like the films of Christopher Nolan. I would rather have had a simpler, neater but more emotionally clear and powerful finale to a superb and ambitious film. 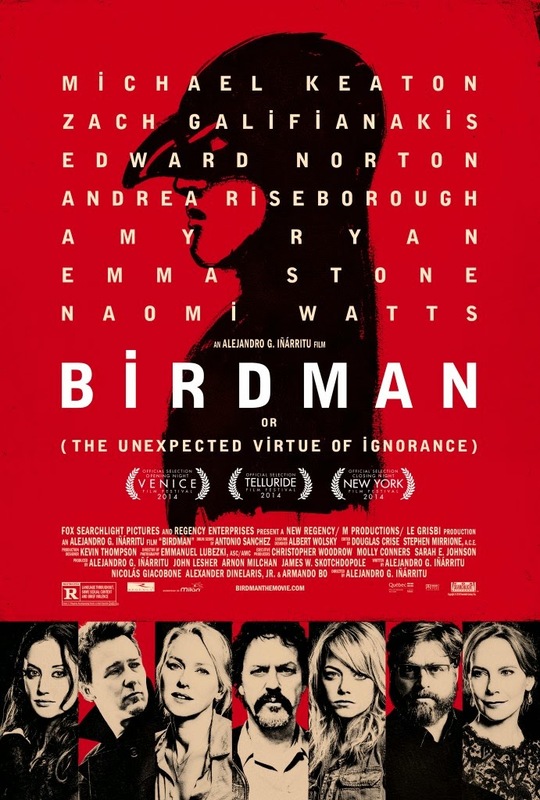 BIRDMAN has a running time of 119 minutes and is rated R in the USA and 15 in the UK. BIRDMAN played Venice, Telluride and London 2014. It opened last year in the USA, Canada, and Mexico. It opens tomorrow in the UK, on January 2nd in Ireland, on January 8th in Portugal, on January 9th in Spain, Sweden and South Africa, on January 15th in Australia, the Czech Republic, Hong Kong, Hungary, New Zealand and Singapore, on January 16th in Estonia, Finland, Lithuania, Latvia and Turkey, on January 22nd in Brazil, Denmark, Greece, Malaysia, the Netherlands and Russia, on January 23rd in Kenya and Poland, on January 28th in Belgium, on January 29th in Germany, Croatia, Israel, and Slovenia, on January 30th in Austria, Bulgaria and India, on February 5th in Italy, on February 6th in Norway, on February 12th in Argentina and Chile, on February 13th in Iceland, on February 20th in Romania, on February 25th in France and in March in Japan.